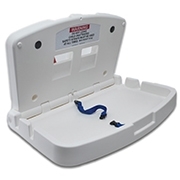 The E-Changer Wall Mounted Changing Table has a generous deep bed and adjustable safety belt. It is constructed to a high specification and meets all global safety standards. It is designed for continuous use up to 30kg. The ultra-slim profile of the changing table also features a built in liner storage and nappy bag hook. The changing table is manufactured in the UK with heavy duty integral molded hinges for added safety. The E-Changer Wall Mounted Baby Changing Table has been designed to be fully compliant with the British standard BS EN12221-1:2008 and EN 12221-2:2008. - Changing table dimensions: 84 x 51 x 9.5cm. - Free baby changing facilities door sign included with each Changing Table.